Meet with your doctor and talk about your weight loss methods. Your doctor will help you identify the habits you need to get rid of and let you know if you are healthy enough to start working out right away. You should also ask about diet pills, gastric bypass and other options: these are good solutions if you have repeatedly tried losing weight but cannot reach a healthy weight in spite of your efforts. Introduce changes slowly. It will be easier for you to get rid of your bad habits and get used to new foods and being more active if you focus on making one change a week. Changing your lifestyle overnight will help you lose a lot of weight but it probably be too hard for you to keep these good habits for more than a few weeks. Introducing changes slowly is the best way to adopt these habits for good and guarantee that you will not go back to your old lifestyle once you reach a healthy weight. Find out why you are overweight. There could be a lot of different reasons: perhaps you overeat because you are depressed, make bad nutritional choices because you do not have enough time to cook or do not get enough exercise because you already have a busy schedule. It will be easier to make changes to your lifestyle once you target the source of your problems. You might have to make some changes to your schedule, get treated for your depression or simply find a new hobby so you can be more active. Make some changes to your diet. Get rid of any unhealthy food: check the labels of the foods you buy and stay away from fast food restaurants. Figure out how many calories you need and make sure you do not eat more than you should. Plan your meals in advance and do your best to eat foods from the five food groups. 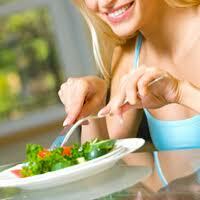 If you always get hungry in between meals, try eating five smaller meals instead of three. You should find new foods and recipes to replace the unhealthy foods you love: try eating more fruits, vegetables, whole grain foods, fish, poultry and nuts. Exercising will help you burn a lot of fat and be much more healthy. You can do some strength training at home to burn some calories and develop your muscles. Do some abs, pushups, pull-ups and similar exercises and consider getting some weights or a rowing machine if you want to tone your muscles. You also need to work on your cardio to strengthen your heart and lose weight: you could run, swim, dance or join an aerobic class. You can work out more efficiently by setting goals and trying to work out more frequently and for longer sessions as you progress. Use these tips to put together efficient weight loss methods. Talk to your doctor about other options if these tips do not help you reach a healthy weight.